Digital marketers and Brands are becoming more data hungry, and they're continually trying to profile their clients. Basically, we're paid internet stalkers. Marketers and data scientists gather a range of data and then analyse user behaviour and activity patterns in order to better understand their customers. The more you know about a customer, their interests and their grievances the easier it is to create content, advertising, product offerings or deals that perform well. This principle is one of the foundations of digital marketing. So it's no surprise that the biggest social media site in the world would like to do the same thing. This month Facebook rolled out a polling tool so that people and Pages can quiz their respective friends and followers across Facebook’s site and mobile apps. Which isn't surprising since Facebook has been on something of a polling craze in the past month (and two years after Twitter added its own polling feature). Last month, it added a polling feature to Instagram Stories. 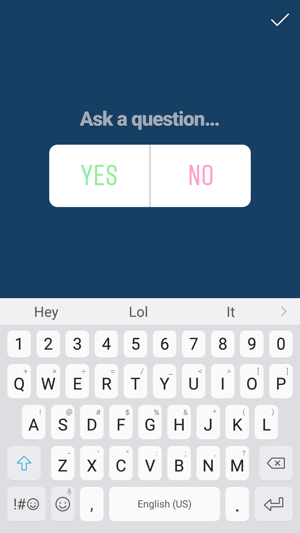 Facebook’s latest polling feature is similar to Instagram Stories’ version in that polls are limited to two answer options. To draw attention to their Facebook polls, people and Pages can attach GIFs and photos, and they can set a time for when voting will close, such as one day, one week or a custom expiration date. Facebook as also announced that it had acquired teen-centric polling app tbh. Tbh, which is an acronym for "To be honest," bills itself as "the only anonymous app with positive vibes." Designed for people 13 and older, the app lets students create anonymous polls about themselves and their friends and has had rampant success in this core demographic. Whats in it for brands? The addition of polling opens up an opportunity for Pages to solicit feedback from their followers without asking them to do anything more than tap a button. Since the average social media users, attention span continues to drop making it easier to interact is a way to improve their engagement rates. Polls are seen a way to augment and spur everyday engagement — “Buying the iPhone X, yes or no?”. Also, worth mentioning is that the person or Page that created the poll will be able to track vote counts, as will those who cast the votes. Why the motivation for polls? Polling potentially opens up a brand new data source for Facebook. Assuming that Facebook designs programs to parse poll questions, the company would be able to use people’s answers to better understand their interests. This data could be made available to advertisers in future to target product or brand preference or even buying intent. Open Facebook and click “What’s on your mind” if you’re on a profile, or “Write Something” if you’re posting to a Page. Select the “Polls” icon to create a poll. Write your question into the status box where it says “Ask a question” and fill in the two options you want people to choose between. Upload your own images or choose from the thousands of GIFs available to add a visual component to the poll. Set when you want your poll to expire- it can be a day, a week, or a custom time frame. Post your poll and watch the votes come in. As the creator, you and the people who voted on the poll can see how others voted. Note:Remember these polls are not anonymous and can be tied back to you. While social media polls aren't going to provide you with a data stream of qualitative data, it is a fun way to mix up your posting schedule while at the same time gauge user interests. Also with Facebook on a big poll drive at the moment who knows how far they're going to take this feature over time.